Enter your email address to receive special messages from Ken! A Small To Medium Size, Visibly Aged And Anciently Patinated, Nicely Made And Flaked Dunn Point That Exhibits Surface Sheen And Stone Aging Coloration Patination, Correct Style Base And Overall Shape, Consistent Aged Surface Deposits, Correct Style Blade Flaking, Correct Material And Manufacture For The Area Found. Found On The Fourche La Fave River, Near The Town Of Rover, Arkansas In Yell County. 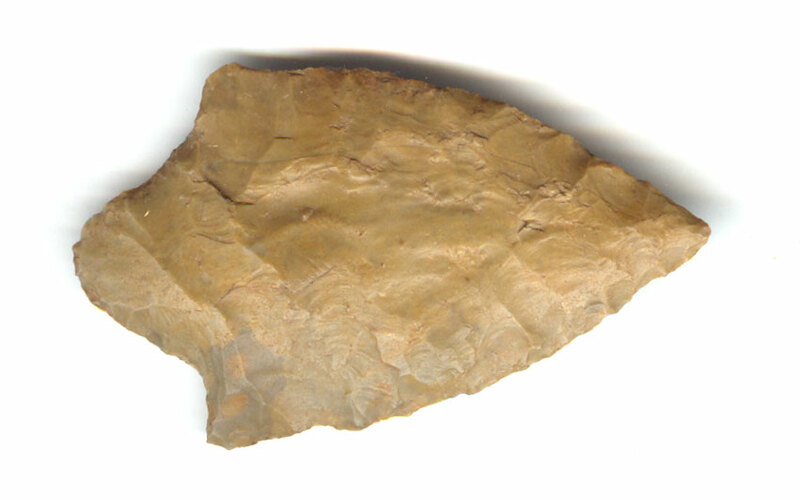 The Dunn Point Was Named By Leon Dunn For Examples Found Near The Arkansas River, South Of Ozark, Arkansas. This Is A Nice, Typically Made Example, Being In Good Condition! Includes A Ken Partain Certificate Of Authenticity.